Hotdogs, freshly cut grass, kids screaming for autographs and the crack of the ball on a wood bat … it's baseball season and Samy's Cameras has a full line of products that all Sports Shooters will need to cover the National Past Time. When was the last time you took a look at that grungy monopod you've carrying around since Mickey Mantle patrolled centerfield for the Yankees? If the legs stick when you're trying to extend them and the rubber base at the end is gone … it's time to call Samy's for a new one. With 400mm and 600mm glass costing big-time $$$, why scrimp and use that crummy old monopod. Samy's Camera's has the entire line of Gitzo and Bogen monopods and tripods IN STOCK! Call for great pricing. Samy's Los Angeles has renovated its camera bag and equipment case area and to mark this event, we're offering a special on Tamrac bags and cases. Call me and ask for the Sports Shooter Special 30% discount on Tamrac gear! 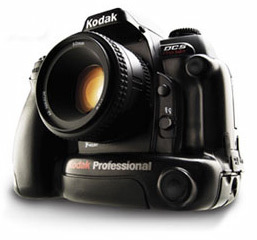 The long-awaited Kodak DCS Pro 14n is beginning to ship! I'm taking orders for this 14.89 million pixel, full-frame 35mm frame CMOS camera. If quality is the name of your game, you'll want to check out all of the specs on the 14n. We also have in stock Nikon's D1H, D1X and D100 digital cameras as well as the complete line of Digital Camera Batteries and accessories. Yo! If you're in the market for a new MacIntosh computer, give us a call and check on competitive pricing on all of Apple's desktop models and PowerBook laptops, including what is becoming the working news photographers' fav … the 12-inch PowerBook. If you've read the exploits of many war photographers working in the Middle East in the SportsShooter.com Message Board, then you know that the new 12-inch PowerBook has been a real hit for it's portability, durability and affordability. On the topic of digital cameras … flash memory has never been so affordable. Why run out to cover a game or news assignment with just a couple of cards? We have great pricing on Lexar's new 40x WA memory cards in all of the popular sizes, 126 to 512 megs. Also, Lexar's new super-sized 32x 1 and 2 gig cards will be available soon. So don't spend time clearing off your cards at half time of that NBA Playoff game when memory cards are so affordable! Samy's is also happy to announce that we will be a participant in this year's Sports Shooter Workshop & Luau on November 7 and 8 in Manhattan Beach, CA. Samy's will join some of the top manufacturers in the computer and camera world in a trade show at this year's Workshop & Luau. Please join us there! Remember for all of your camera, digital, film, computer and video needs, we're just a phone call away. Samy's has four stores in Southern California to serve all your photographic and rental needs. If you're from out of the LA area but in town on assignment or enjoying the great LA weather on vacation, please stop buy and check out one of our stores and say "hello!" Check out this Blog: Click Here ::..